George-Étienne Cartier was one of the most influential politicians of his generation. Together with John A. Macdonald, he was co-premier of the Province of Canada. He took part in the Charlottetown, Québec and London conferences, and was among the most ardent supporters of Confederation. As one of the primary architects of Canadian Confederation, George-Étienne Cartier fully deserves to be called a Father of Confederation. Admitted to the Bar of Lower Canada in 1835, the first part of George-Étienne Cartier's public life was linked to the cause of the Patriotes. In 1834, he worked to elect Louis-Joseph Papineau and Robert Nelson. He was also a member of the Fils de la Liberté (Sons of Liberty) and, during the 1837 Rebellion, fought in the battle of Saint-Denis (November 22). After a brief exile in the United States, he returned to Lower Canada, where he practiced law from 1839 to 1848. The Sulpicians and the Grand Trunk Railway were among his clients. In fact, it was George-Étienne Cartier who, in 1852, presented a bill to the Union parliament to create the Grand Trunk Railway Company of Canada. 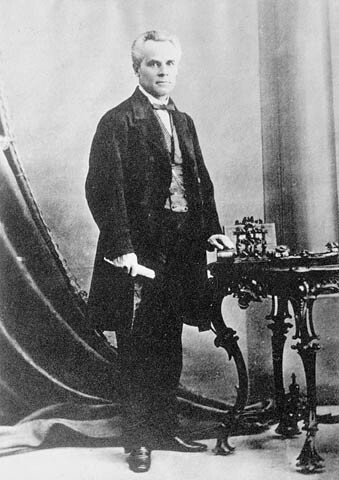 George-Étienne Cartier entered politics in 1848, when he was elected to the Legislative Assembly of the Union of Canada as the representative for the riding of Verchères. In 1854 he joined the Cabinet, becoming provincial secretary for Canada East. When Étienne-Paschal Taché left political life, George-Étienne Cartier replaced him to form the government with John A. Macdonald, first from 1857 to 1858, and then from 1858 to 1862. After Sir Louis-Hippolyte La Fontaine left and Étienne-Paschal Taché retired from politics, George-Étienne Cartier became the most influential politician in Canada. Following in the intellectual footsteps of Sir Louis-Hippolyte La Fontaine, George-Étienne Cartier was in agreement with the Act of Union but began in 1858 to actively promote a federation of the provinces in North America. To this end, he travelled to London with Alexander Tilloch Galt and John Ross to try to convince Queen Victoria of the merits of a British North American union. Political instability in the Province of Canada reached its peak at this time, with no less than six governments in six years. George-Étienne Cartier joined the Great Coalition of 1864 to mitigate this situation and to set in motion the process leading to Confederation. On July 1, 1867, George-Étienne Cartier entered John A. Macdonald's first government as minister of militia and defence. As the law of the time allowed, he also ran in the provincial election and was elected into the government of Pierre-Joseph-Olivier Chauveau. Defeated in the 1872 federal elections in Montréal East, he was parachuted into the Provencher constituency in Manitoba. He would never see his riding. George-Étienne Cartier oversaw the negotiations between the Canadian and British governments and the Hudson's Bay Company in the purchase of the North-Western Territory and Rupert's Land. He also negotiated the creation of the province of Manitoba with Alexandre-Antonin Taché. He later played an active role in the negotiations leading to the entry of British Columbia into Confederation. It was also Cartier who, in 1872, introduced the bill on the construction of the Canadian Pacific Railway in the House of Commons. After his defeat in Montréal East in 1872, George-Étienne Cartier travelled to London hoping to find a cure for the chronic kidney condition which had plagued him for many years. His health did not improve and he died in London at the age of 58. When John A. Macdonald, his political ally for close to 20 years, announced news of Cartier's death to the House of Commons, he was reduced to tears. George-Étienne Cartier's funeral in Montréal drew a crowd the likes of which the city had never seen before. Sweeny, Alastair. "Cartier, Sir George-Étienne". The 1999 Canadian encyclopedia: world edition. Toronto : McClelland & Stewart, 1998.